If you are short of time, the answers to the following 3 questions should let you know all you need to about the Uber Sonic toothbrush. If I have missed something, let me know in the comments. If you want more detail, you can read my full Uber Sonic Electric Toothbrush Review further down the page. No its a solid performing brush. Ideally it would come with a pressure sensor, perhaps be a little more grippy, but this might well detract from the slim and stylish look, that won it the Red Dot award. It would be nice to have a little extra flexibility in the subscription plan, but improvements have been made to give you and I more flexibility and choice. If considering the brush on its own, rather than the whole subscription service then the Oral-B Pro 2 2500 would be our recommendation as it offers similar features and design. Another option is the Sonicare EasyClean. However, part of what makes Uber Sonic unique is the subscription service and the only competitor to this is the US-based Quip. A market leader in the space, they do deliver to the UK, but everything is priced in USD ($) and the initial purchase price is higher. For a more detailed look at the various subscription options, see our best toothbrush subscription post. 3. Where is the best place to buy the Uber Sonic toothbrush? This allows for competitive pricing and efficient service and support. Spotify, Netflix, NowTV, HelloFresh and many more; many industries now have subscription based services, and for good reason. Typically more appealing to the younger and digital generation, these services normally offer flexible contracts, clear pricing structures and an ability to reduce the upfront cost. Uber Sonic is one such offering for the toothbrush and dental health market. The UK based service offers a fairly simple and uncomplicated package option. But how does it really stand up and fare in comparison to other brushes on the market? It what is typically a slow moving industry, does the Uber Sonic offering have what it takes to be the revolution in dental health habits? I am sure you are no stranger to subscription based services, but allow me to explain how Uber Sonic works. They have 3 different packages, designed for 1, 2 or 3 people, priced at £19, £32 or £48. 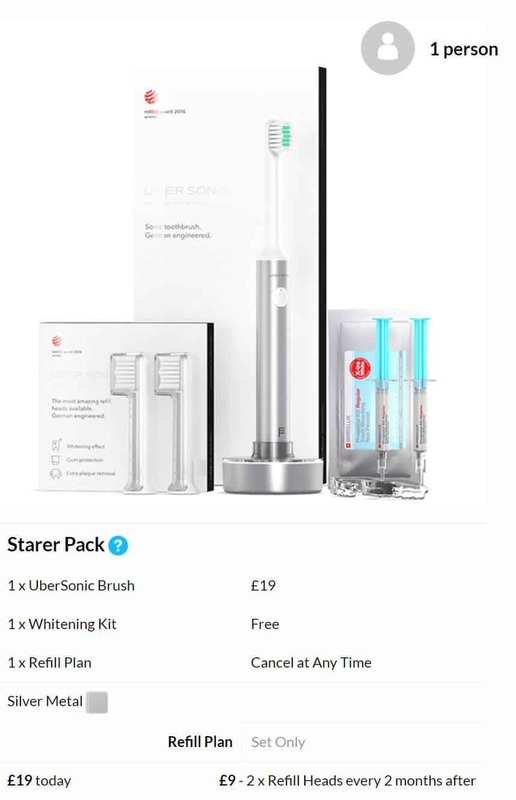 With the standard, 1 person package at £19 you get the Uber Sonic brush handle, pre-fitted with a single brush head and a charging stand too, you also get a refill pack containing 2 brush heads and a tooth whitening kit. Buy the kit for 2 or 3 people and you get the same kit as you would for 1 person but doubled or tripled, with a small cost saving applied. The whitening kit is delivered along with the first refill shipment, which is sent 1 month after the delivery of the Uber Sonic toothbrush. After this you will receive a refill shipment every two months for £9/18/27 (subject to package) which will contain 2/4/6 refill heads. There are no shipping fees, these are included in the price. You are free to choose how long you wish to continue your membership. The bi monthly shipments with replacement brush heads can be cancelled by contacting their customer service team at least two weeks prior to your next shipment. All customers who choose to remain a member for a second year receive special benefits. 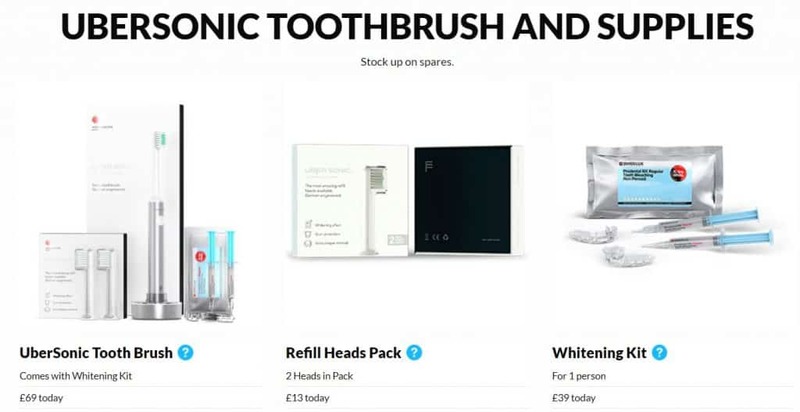 A new Uber Sonic toothbrush will be sent free of charge, as well as a new teeth-whitening kit. Payments for the subscription service can be made with all major credit and debit cards or using PayPal. There is now too the option to buy the brush, brush heads and whitening kit as an individual purchase and not on subscription. The costs are higher. Subscription – It is a novel and very current way of offering up dental health services. Design – It is a very slim and fairly premium handle given the price paid. Built in timer – Brush for the right amount of time and evenly thanks to the quadpacer. Clean – The resulting clean from brushing feels good. Whitening kit – Potentially beneficial but I have reservations on the way in which it is packaged. Fixed subscription plans – It would be great if you could change the subscription plan for brush heads, to decrease the frequency of replacements. As toothbrushes go, they tend not to be all that exciting. Although, there are an increasing number coming with clever features and colour options, making them more appealing. The Uber Sonic Club electric toothbrush does however have something quite cool to shout about. This brush handle was in 2016 a Red Dot award winner. If you are not familiar, Red Dot is a much desired accolade that recognises good design of products in all manor of different product categories. It is primarily the flight grade aluminium handle and simplistic design that allowed it to win the award, it is not something I have seen before on a toothbrush. As such then, it fits perfectly into the lives of those who are fashion and design conscious individuals. Sadly the award does not consider the effectiveness of the clean and from what I can tell there are no studies that compare Uber Sonic to the leading brands like Oral-B and Sonicare, but from my hands on time, the clean seems to be just as good. The brush was developed in conjunction with dentists, which I can believe. From the moment you receive the box, there is a focus on design and the packaging looks smart and is amongst some of the better ones I have seen. A mix of White, Black and Silver looks elegant. Included in the box with the brush handle is a brush head, a travel cap, charging stand and a manual. The manual is notably well designed. Simple, not full of lots of disclaimers and in English only. You need not squint to read small print and there are clear graphics too. The tagline on the box and the packaging is ‘proud maker of whiter smiles’. This works in two parts. First there is the electric toothbrush and the benefits this brings and then there is the Whitening Kit, more on this shortly. The brush handle does look good, the Silver coloured aluminium around the body of the handle is smart and smooth to the touch. The brush is very slim in hand, with just a 2cm diameter. Some might argue it is almost too slim and there is nothing in the way of grips on the handle. The closest thing to this is the concave power button that sits in the upper third of the brush handle. White in colour, the round button contrasts against the silver and provides a fairly tactile response. Within this power button is a very small LED that illuminates Green, either a steady Green or flashing Green to represent the charging or running of the brush. At the top of the Silver handle is the Uber Sonic logo and there is too a another small logo at the bottom third of the hande. The cylindrical handle is free of any other buttons or grips. On the rear, at the very top of the handle, but before the brush head, is a small, raised white plastic lip that actually allows the brush to lay flat on a countertop or work surface. It stops the brush rolling and the bristles coming into contact with the surface on which it is sat. On the base of the brush is a small circular recess into which the prong on the provided charging stand fits. As is common with most electric toothbrushes, it charges inductively and sits upright on the stand. The base of the brush is plastic as is the detachable brush head and attachment. At the top of the brush handle is the head provided by Uber Sonic. Unlike other brands they offer one style of head only, a universal design if you like. The bristles are cut to differing lengths to provide a good clean to the surface of the teeth and gums, and the head is an rounded rectangle shape, more like a traditional brush head than the small round heads of Oral-B. The bristles are not the softest of the most stiff I have felt on a brush head and should suit most users quite happily. The motor built into the handle moves the head at up to 35,000 movements per minute. The head locks into place on the handle. Turn it about 45 degrees to the right to unlock and left again to lock it in place. When in the unlocked position the head can be pulled off the handle. As you fit the head, inside the shaft of the head fits the plastic mechanism which delivers the movements from the motor to the head. Inside the handle is the brush motor and the battery. These are not user removable and are not designed to be replaced. The handle is sealed and is water resistant. This means you can get the handle wet, and it can happily be rinsed under a tap, but it should not be submerged in water. To power on the brush, simply press the power button once, and the brush powers on, launching into the one and only cleaning mode. Moving the bristles at up to 35,000 times per minute you do get a good clean and whilst I personally prefer the clean offered by Oral-B smaller round brush heads I was pleased with the results as I used the brush. Dentists recommend a 2 minute clean of the teeth twice a day and the Uber Sonic conforms to this. When the brush is powered on, it activates a built in timer and quadpacer. At 30 second intervals the brush will provide an audible warning via a slight pause in the brush motor at to tell you to change quadrant. Once the 2 minutes are up the brush automatically turns itself off, a clear indicator that the clean is over. The timer is more important the one might think so it is really good to see this included. Sadly, a pressure sensor is not. Now these are not commonplace on all electric toothbrushes, but as a cause of gum recession can be overbrushing a pressure sensor can alert you when you are brushing too hard. Bristles of the brush head need only skim the tooth and gum surface. If you are brushing too hard, you might hear the motor of the brush straining via a change in the sound, but you get no visual alert to this. The brush does not offer Bluetooth connectivity like some of the newer models from competing brands nor does it offer a travel case. Provided is a basic plastic cap that would fit over the brush head to protect it, but does not give the better protection of a proper case. Accidental activation of the brush is possible as the power button cannot be locked or protected in transit. Therefore the brush itself is overall not all that bad. It appears not to offer lots of features or functions you won’t use and is focused on delivering a good clean and I like that. So here then I wish to address some of the issues or possible negatives with Uber Sonic. These are personal, so your opinion might be different, but I present the facts. Brush heads are supplied in such a fashion that the intention is to replace the brush head every month. Whilst how often you change your brush head is actually up to you, there is no option to change the subscription plan to have heads delivered more or less frequently or purchase on an adhoc basis. The general recommendation (from dentists) is to replace brush heads on any toothbrush every 3 month’s, as typically this is when a head begins to wear out. Replacing every month seems a little unnecessary and it is too a little wasteful on the environment. Changing the frequency could save you money too, if it were an option. As part of the subscription, if you enter into your 2nd year you get sent another brush handle. Great. But why? Uber Sonic say this is a gift for a customer’s loyalty. Seems a little unnecessary. I would prefer a cost saving. But, failing that would love the idea of passing the new handle to a friend or family member for them to get value from it, but what about brush heads? Uber Sonic have in part addressed a prior criticism of their service. You can now buy brush heads in packs of 2. It requires an individual purchase and is not on subscription, but it’s a great option nonetheless. The simplicity of the subscription service works in everyone’s favour on the whole, but I am sure more flexibility would make for a more satisfying customer experience. There need not be lots of changes, but a few to address some of these issues. Just having new heads every 3 month’s or a delivery with a year’s supply of heads would be great. What about doing away with the replacement/additional brush handle and reducing the cost in year 2? In Uber Sonic’s defence, since initially reviewing this brush they have updated their options to allow ad hoc, 1 off purchases. Uber Sonic’s website does lack some additional information that I personally would like to see. There is no mention of the battery performance for example nor does it explain that beneficial features like a timer is built in. The good news is most questions you may have are answered in this review. My last reservation is surrounding the whitening kit that is provided as part of the package. Many of us like the idea of and desire whiter teeth and a whitening process is usually the way forward for the best results. Brushing alone can help, but for the marked difference, cosmetic whitening of the teeth is the answer. There are lots of different solutions available with varying safety and results. Advice is normally to get the whitening process completed by a dental professional who is trained in the process and care of teeth. There has been within the media lots of talk about how people have suffered damage and pain from getting their teeth whitened through various unreliable outlets and sources whose practices are questionable. This said, there are some kits out there that can work and are safer than others. Many dentists themselves even offer a do it yourself at home kit, but in this instance they are usually tested and approved. I chose not to try the whitening kit supplied. Uber Sonic’s website promotes the whitening kit, but offers no details on what is in it, how to use it or what results to expect. The FAQ’s on the site are minimal and suggest it is safe and compliant with EU standard and contains no peroxides. When the kit actually arrives there is a small piece of paper that explains how to use the kit, but no mention of the ingredients in the provided syringe. The documentation suggests the syringe will show an expiry date, but it does not. Call me sceptical or worrying for nothing, but should I use this product, react to it or suffer side effects; I cannot give the medical professional any real clue as to how to treat the issue. I personally believe listing ingredients on a package is a minimum requirement for safety given it is a gel to be placed in the mouth. Of course, you need not use the whitening kit, but it is included and you are essentially paying for it, so it would be nice to take advantage of it. If you take the whitening kit out of the equation here, the subscription model is a positive one. It works for many people today, particularly the younger generation. A subscription service like Uber Sonic takes away the small stresses of remembering to buy replacement brush heads, they just turn up. The make life a tiny bit simpler and more convenient. Yes, you pay for it, but actually the cost is not all that bad and there is a price to be paid for convenience. Although not stated on the website, I was advised by the PR team that the battery life of the Uber Sonic brush is 15 days, based on 2 cleans per day. My own hands on testing has revealed it lasts for 50 cleaning sessions lasting 2 minutes. That is 100 minutes of usage time or 25 days use from the built in Lithium-Ion battery. This is very respectable given how slim the handle is and is a fraction better than Sonicare and Colgate brushes. It also outperforms the suggested usage time. Supplied in the box is a weighty charging stand. Finished in the same aluminium as the handle it looks the part. The circular design blends with the handle well and the brush sits on the top in the centre, with a charging pin that protrudes from the stand fitting into the recess on the base of the handle. There is a slight bit of play in the handle when on the stand but it should stand fairly upright most of the time. Unusually, this stand is hardwired with a 3 PIN UK plug. Usually this is a 2 PIN plug suitable for UK bathrooms or in some instances a USB cable. This means the brush will need to be charged outside of the bathroom. Being hard wired there is no way to change this to USB if you wanted either. The stand supports 100-240v, so you are good for travelling but you may require a plug adapter. When on the stand, the green light within the power button flashes Green. When fully charged it changes to a solid Green. I left the brush on charge for a full 24 hours to make sure it was charged, but you can leave it on charge for less time than this. When the brush is running low, around 10% battery power left, the LED flashes Red. When really low it is a solid Red. As the result of Uber Sonic being a subscription based service, the way I talk about and compare the pricing of this brush is a little different and more difficult to make a direct comparison. The cost of the basic 1 person subscription service starts at £19 with a further charge of £9 every 2 months. 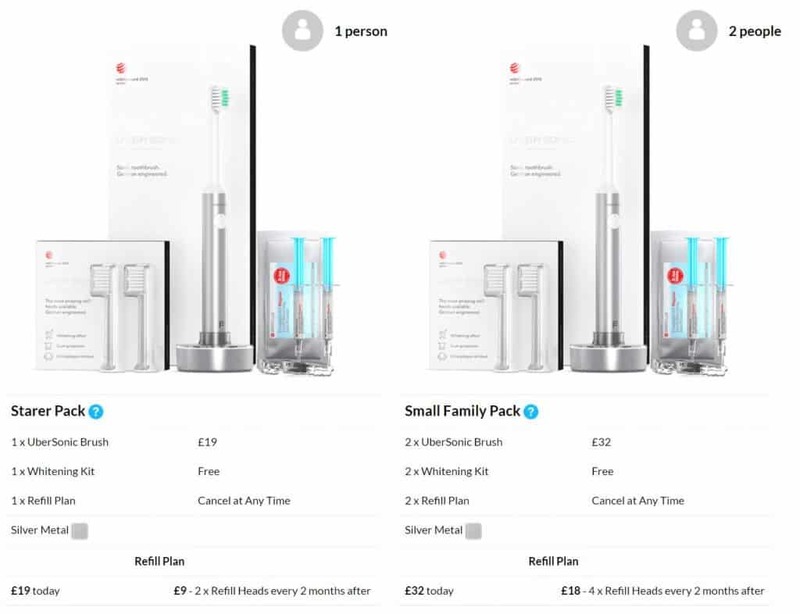 The £19 cost gets you the Uber Sonic electric toothbrush, a whitening kit and your first delivery of a refill pack that contains 2 replacement brush heads. The frequency with which the service operates means you actually have a new brush head every month as opposed to the more standard, 3 month’s for a new head. This brings a year’s subscription to £64 (19 + (5x£9)). On the face of it, for a new electric toothbrush and replacement brush heads, this does not seem too expensive and quite reasonable. In year 2, the cost remains at £9 every 2 months, but you will actually also receive another Uber Sonic brush and a whitening kit at no extra cost. The cost for year 2 would be £54 as would the cost for year 3. 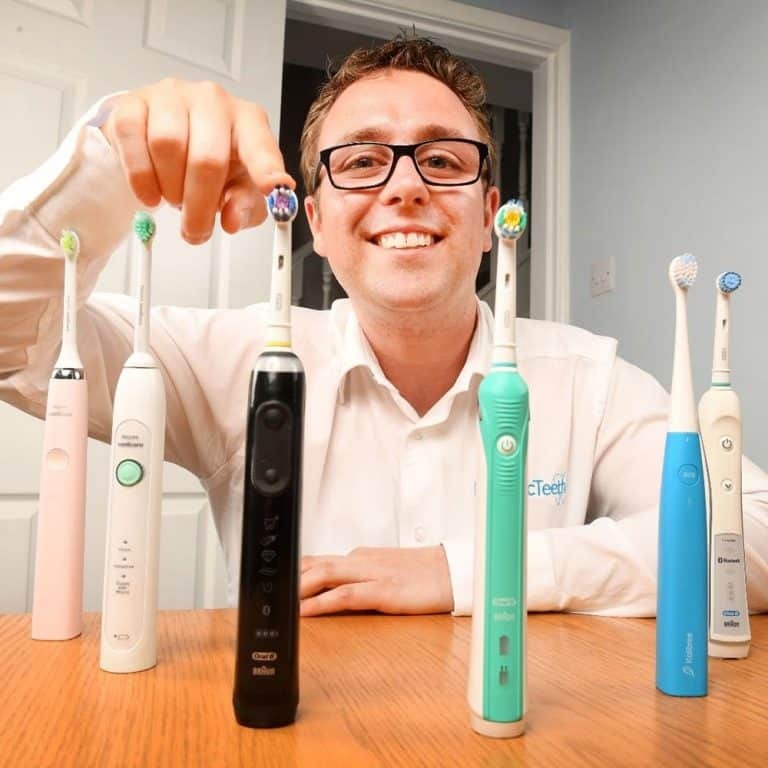 We understand the typical life of an electric toothbrush to be 3-5 years, so as best as possible we price the brush over this time period here at Electric Teeth. The cost will be £153 or 14p per day over 3 years. A point to note, this price includes receiving at least 1 additional brush handle and a new brush head for every month of the subscription, when normally you would replace the head every 3 months. You will also get 2-3 whitening kits included. Now, whilst it is difficult to make direct comparison, an Oral-B electric toothbrush with equivalent features would cost £74 or 7p per day with brush heads being changed every 3 month’s. If we made it every month as per Uber Sonic, then the cost would rise to around £150. This would not include the whitening kit, nor the additional brush handle or the subscription based delivery to your door. However, retailers like Amazon do offer subscription services for brush heads, so you can achieve the same effect and importantly here, you can chose the delivery schedule and cancel at any time. Quip are an American based subscription service that does deliver to the UK, but their packages are different and they charge in USD. Whilst subject to change a very rough calculation makes their service about £120 over 3 years with replacement heads every 3 month’s. As a subscriber you can cancel at any time, but must be done at least 14 days before the next refill pack is shipped to avoid incurring an unnecessary cost. To keep the cost down, it would be nice to see the option of reducing the frequency of refills and perhaps forgoing the new brush every year too. Since reviewing this brush in 2017, Uber Sonic have in 2018 updated their options to allow individual purchases of the brush handle and heads. It works out more expensive than the subscription service as you might expect, but allows you to reduce the frequency. Comparing to Oral-B’s Pro 2 2000, when purchased individually and replacing the head every 3 months, the cost would come out as £127.50 or 12p per day. Please note that all costs quoted are correct at the time of writing and are subject to change. 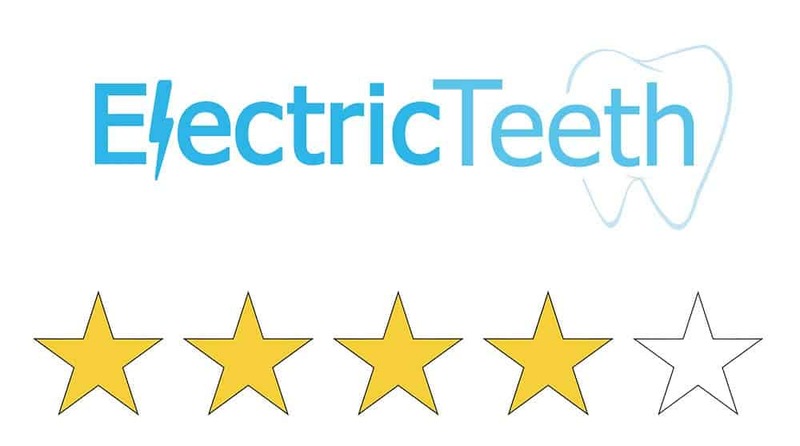 The team at Electric Teeth like to test the products as best as possible, but we are consumers just like you. The only difference really being, we have handled many different electric toothbrushes so can make comparisons to those. We are not a specialist testing lab nor do we have specialist tools to really analyse and these products and test to their limits. However, having handled many brushes we have come to determine what makes a good brush. The Uber Sonic does not immediately offer up any concerns in the build or reliability. It appears sturdy and well built with a blend of aircraft grade aluminium and plastic. The limited number of buttons and ports limit areas of weakness. The brand does not make any comment about warranty provisions in their documentation or on their website. Should the brush stop working, I believe it would be replaced at no cost to you, but have not experienced this to comment. You do receive a new brush handle every year, if you continue your subscription, which could be construed as a sign of the product not likely to last much longer, or is a nice gesture to spread the word of Uber Sonic. The handle is water resistant and will survive exposure to water, toothpaste, saliva etc. It should not however be submerged. A lack of clinical evidence there might be, but the brush itself is well designed and works well and left my teeth feeling clean and fresh after use. It is smart and stylish too. I have concerns personally for the wasteful approach to brush heads and the additional handles that are supplied along with the lack of basic safety standards with the whitening kit, you may see this differently. The subscription model that Uber Sonic propose is in my mind a winning formula as the way in which we as individuals consume and subscribe to products and services evolves. It would be preferred if there was some additional flexibility in how frequently brush heads were replaced, but the introduction of individual, not on subscription purchase options is great to see, with more choice for all. Is the Uber Sonic oscillating brush? No, it is a sonic toothbrush and does not oscillate. The handle offers one cleaning mode, the standard clean mode that uses a sonic cleaning motion to move the bristles up to 35,000 times per minute for effective brushing. The brush heads that is supplied with the Uber Sonic is their own standard brush head. There is this one and only style and not the vast range like you get with Oral-B or Sonicare. You cannot use alternative heads from other brands. You get 3 head included in your first package and 2 replacement heads posted to you every 2 month’s. Does the Uber Sonic have a pressure sensor? Does the Uber Sonic have Bluetooth? Does the Uber Sonic come with a warranty & how long is it? Uber Sonic’s documentation or website makes no mention of a warranty or guarantee. Judging by my experience the brush will last a couple of years quite happily. However, as per the terms of the subscription, you can cancel at any time and by re-subscribing you would in theory get sent a new brush for just £19. I suspect if you raised the issue during your subscription, the brush would be replaced without needing to cancel. As part of the subscription, if you retain this for a year, you will automatically get a new brush sent 12 months after the signup. Does the Uber Sonic have a built in timer? Yes. Often referred to as the quadpacer; the brush will provide an audible warning through a slight pause in the brushing mode to tell you to change quadrants. There are 4 quadrants to the mouth, and brushing is normally for 2 minutes. The timer will active at 30 second intervals. At 2 minutes the brush will automatically power offer, to signal the end of the clean. The battery lasts up to 100 minutes, which if used on the standard daily clean mode is 25 days based on 2 cleans per day. The Uber Sonic charging station has not been designed to be fixed to a wall and should sit on a flat surface. Can I use the Uber Sonic in the shower? Yes. The Uber Sonic is water resistant so if you choose you can use it in the shower. Avoid submerging it in water. No, a travel case is not included in the box, but you do get a plastic cap that goes over the brush head to protect the bristles. Do you own or have you used the Uber Sonic brush? The Uber Sonic brush spoken about in this review was provided by Uber Sonic Club’s PR department. Electric Teeth did not purchase this model. No financial reward was provided to conclude the review the way that we did. I have contracted with Ubersonic since September 2017. The toothbrush now has to be charged daily as the toothbrush can only be used twice a day before needing to be re-charged, I was expecting to receive a replacement tooth brush as contracted after 1year. This has not been received. Very disappointing, I will be cancelling my membership if this replacement is not received in the very near future!! I am sorry to hear that you have not been sent a replacement. Perhaps you could email a copy of your email (with a brief intro) to us? We will then forward onto our contact at Uber Sonic to see if we can get things moving forward a bit quicker for you?! Having a bad experience with these guys. The whitening kit hasn’t arrived. But more concerning is several emails to them raising issues have gone unanswered. The last one was about concern over the battery life – I am recharging every couple of days and the time inbetween charges has decreased even in the time I have had the product. I’m now in a position where I will probably cancel my subscription and cut my losses if I can’t get a response in the next few days. So might be a half decent product but if they can’t do follow up why bother with them. This does not make for good reading. Web based companies offering subscription services like this should have exceptional response times and deal with your queries. Hopefully this is just a blip and there is some logical explanation. I do understand your point of view and have a similar view if I were in your shoes. I have had no reason to make contact with Uber Sonic of late, but will make an attempt to see if I get a response. It is a decent product all told. I had a quick response from my contact at Uber Sonic, whose reply was. The only thing I can think has anything to do with it that there’s been issues related to the customer service mail program. If you forward their names I’ll ask customer service to look into it. Please let those you have spoken with know that everything’s alright. I have passed on your email address and should expect you to get an update soon. Hi Kate, I have recently purchased an Uber sonic as well. I opened a line of communication a day after putting in my order to see how they responded. About three hours later i had a reply, as well as them keeping my up to date with my tracking numbers and delivery date for the toothbrush. They seemed very helpful and switched on. I suspect this is a technical glitch rather than them ignoring you. I would be interested to see how they resolve the battery issue, mines been great so far. Two week charges, as good as i could hope for! I am a bit of a geek when it comes to technology. I have almost every electric toothbrush you can buy – Philips Sonicare, Oral B, Colgate ProClinical, Uber Sonic, Emmi Dent Ultra Sonic – you name it, I have tried it. As well as the toothbrushes I have tried many different heads too. As a 60 year old my concerns are receding gums, interdental cleaning and a tendency for my gag reflex to be set off with certain brush heads..
To cut a long story short I have found the Uber Sonic best. It does not irritate that very slight gap between teeth and gums, manages to clean pretty well between my teeth, does not cause me to gag while cleaning my teeth and gives me that lovely clean feeling. I love the price and the simplicity of the brush handle – one cleaning mode is absolutely enough for most people. I despair at the unnecessary plethora of options available in some brushes. Less is more. I like that adage. I was disappointed to find Uber Sonic has fitted a UK 3 pin plug to the charging base – would make my bathroom shaver point useless had I not been able to purchase a user-fittable continental 2 pin plug from eBay. While fitting this I shortened the cable considerably to fit better on the small shelf I have underneath the shaver socket. Thanks for the comments Philip. Interesting you have had to go through so many to get to this one and find it is the one that works for you, but ultimately you have so that is most important. A bit of DIY to make it suit your particular setup is good. I actually quite liked the 3 pin plug, but perhaps the happy medium is 2pin with a 3 pin adapter in the box.